Shield volcanoes are built by effusive eruptions, which flow out in all directions to create a shield like that of a warrior. The word "shield" has a long history, and is derived from the Old English scield or scild, which is in turn taken from the Proto-Germanic *skelduz, and related to the Gothic skildus, meaning "to divide, split, or separate". Shield volcano itself is taken from the German term Schildvulkan. Diagram of the common structural features of a shield volcano. Shield volcanoes are distinguished from the three other major volcanic archetypes—stratovolcanoes, lava domes, and cinder cones—by their structural form, a consequence of their unique magmatic composition. Of these four forms shield volcanoes erupt the least viscous lavas: whereas stratovolcanoes and especially lava domes are the product of highly immotile flows and cinder cones are constructed by explosively eruptive tephra, shield volcanoes are the product of gentle effusive eruptions of highly fluid lavas that produce, over time, a broad, gently sloped eponymous "shield". Although the term is generally ascribed to basaltic shields it has also at times been appended to rarer scutiform volcanoes of differing magmatic composition—principally pyroclastic shields, formed by the accumulation of fragmental material from particularly powerful explosive eruptions, and rarer felsic lava shields formed by unusually fluid felsic magmas. 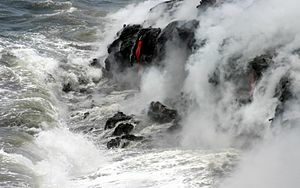 Examples of pyroclastic shields include Billy Mitchell volcano in Papua New Guinea and the Purico complex in Chile; an example of a felsic shield is the Big Obsidian Flow in Oregon. Shield volcanoes are also related in origination to vast lava plateaus and flood basalts present in various parts of the world, generalized eruptive features which occur along linear fissure vents and are distinguished from shield volcanoes proper by the lack of an identifiable primary eruptive center. Active shield volcanoes experience near-continuous eruptive activity over extremely long periods of time, resulting in the gradual build-up of edifices that can reach extremely large dimensions. With the exclusion of flood basalts, mature shields are the largest volcanic features on Earth: the summit of the largest subaerial volcano in the world, Mauna Loa, lies 4,169 m (13,678 ft) above sea level, and the volcano, over 60 mi (100 km) wide at its base, is estimated to contain about 80,000 km3 (19,000 cu mi) of basalt. The mass of the volcano is so great that it has slumped the crust beneath it a further 8 km (5 mi); accounting for this subsidence and for the height of the volcano above the sea floor, the "true" height of Mauna Loa from the start of its eruptive history is about 17,170 m (56,000 ft). Mount Everest, by comparison, is 8,848 m (29,029 ft) in height. In September 2013 a team led by the University of Houston's William Sager announced the singular origination of Tamu Massif, an enormous extinct submarine shield volcano of previously unknown origin which, approximately 450 by 650 km (280 by 400 mi) in area, dwarfs all previously known volcanoes on the planet. The research has not yet been confirmed. Shield volcanoes feature a gentle (usually 2° to 3°) slope that gradually steepens with elevation (reaching approximately 10°) before eventually flattening near the summit, forming an overall upwardly convex shape. In height they are typically about one twentieth their width. Although the general form of a "typical" shield volcano varies little worldwide regional differences exist in their size and morphological characteristics. Typical shield volcanoes present in California and Oregon measure 3 to 4 mi (5 to 6 km) in diameter and 1,500 to 2,000 ft (500 to 600 m) in height; shield volcanoes in the central Mexican Michoacán–Guanajuato volcanic field, by comparison, average 340 m (1,100 ft) in height and 4,100 m (13,500 ft) in width, with an average slope angle of 9.4° and an average volume of 1.7 km3 (0.4 cu mi). Rift zones are a prevalent feature on shield volcanoes that is rare on other volcanic types. The large, decentralized shape of Hawaiian volcanoes as compared to their smaller, symmetrical Icelandic cousins can be attributed to rift eruptions. Fissure venting is common in Hawaiʻi; most Hawaiian eruptions begin with a so-called "wall of fire" along a major fissure line before centralizing to a small number of points. This accounts for their asymmetrical shape, whereas Icelandic volcanoes follow a pattern of central eruptions dominated by summit calderas, causing the lava to be more evenly distributed or symmetrical. Most of what is currently known about shield volcanic eruptive character has been gleaned from studies done on the volcanoes of Hawaiʻi island, by far the most intensively studied of all shields due to their scientific accessibility; the island lends its name to the slow-moving, effusive eruptions typical of shield volcanism, known as Hawaiian eruptions. These eruptions, the calmest of volcanic events, are characterized by the effusive emission of highly fluid basaltic lavas with low gaseous content. These lavas travel a far greater distance than those of other eruptive types before solidifying, forming extremely wide but relatively thin magmatic sheets often less than 1 m (3 ft) thick. Low volumes of such lavas layered over long periods of time are what slowly constructs the characteristically low, broad profile of a mature shield volcano. Also unlike other eruptive types, Hawaiian eruptions often occur at decentralized fissure vents, beginning with large "curtains of fire" that quickly die down and concentrate at specific locations on the volcano's rift zones. Central-vent eruptions, meanwhile, often take the form of large lava fountains (both continuous and sporadic), which can reach heights of hundreds of meters or more. The particles from lava fountains usually cool in the air before hitting the ground, resulting in the accumulation of cindery scoria fragments; however, when the air is especially thick with clasts, they cannot cool off fast enough due to the surrounding heat, and hit the ground still hot, accumulating into spatter cones. If eruptive rates are high enough, they may even form splatter-fed lava flows. Hawaiian eruptions are often extremely long lived; Puʻu ʻŌʻō, a cinder cone of Kīlauea, has been erupting continuously since 1983. Flows from Hawaiian eruptions can be divided into two types by their structural characteristics: pāhoehoe lava which is relatively smooth and flows with a ropey texture, and ʻaʻā flows which are denser, more viscous (and thus slower moving) and blockier. These lava flows can be anywhere between 2 and 20 m (10 and 70 ft) thick. ʻAʻa lava flows move through pressure—the partially solidified front of the flow steepens due to the mass of flowing lava behind it until it breaks off, after which the general mass behind it moves forward. Though the top of the flow quickly cools down, the molten underbelly of the flow is buffered by the solidifying rock above it, and by this mechanism ʻaʻa flows can sustain movement for long periods of time. Pāhoehoe flows, in contrast, move in more conventional sheets, or by the advancement of lava "toes" in snaking lava columns. Increasing viscosity on the part of the lava or shear stress on the part of local topography can morph a pāhoehoe flow into an a'a one, but the reverse never occurs. Although most shield volcanoes are by volume almost entirely Hawaiian and basaltic in origin, they are rarely exclusively so. Some volcanoes, like Mount Wrangell in Alaska and Cofre de Perote in Mexico, exhibit large enough swings in their historical magmatic eruptive characteristics to cast strict categorical assignment in doubt; one geological study of de Perote went so far as to suggest the term "compound shield-like volcano" instead. Most mature shield volcanoes have multiple cinder cones on their flanks, the results of tephra ejections common during incessant activity and markers of currently and formerly active sites on the volcano. One prominent such parasitic cones is Puʻu ʻŌʻō on Kīlauea—continuous activity ongoing since 1983 has built up a 2,290 ft (698 m) tall cone at the site of one of the longest-lasting rift eruptions in known history. 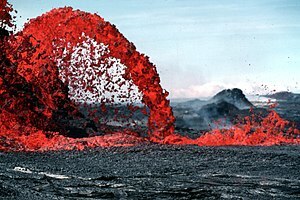 The Hawaiian shield volcanoes and the Galápagos islands are unique[clarification needed] in that they are not located near any plate boundaries; instead, the two chains are fed by the movement of oceanic plates over an upwelling of magma known as a hotspot. Over millions of years, the tectonic movement that moves continents also creates long volcanic trails across the seafloor. The Hawaiian and Galápagos shields, and other hotspot shields like them, are both constructed of oceanic island basalt. Their lavas are characterized by high levels of sodium, potassium, and aluminium. Features common in shield volcanism include lava tubes. Lava tubes are cave-like volcanic straights formed by the hardening of overlaying lava. These structures help further the propagation of lava, as the walls of the tube insulates the lava within. Lava tubes can account for a large portion of shield volcano activity; for example, an estimated 58% of the lava forming Kīlauea comes from lava tubes. In some shield volcano eruptions, basaltic lava pours out of a long fissure instead of a central vent, and shrouds the countryside with a long band of volcanic material in the form of a broad plateau. Plateaus of this type exist in Iceland, Washington, Oregon, and Idaho; the most prominent ones are situated along the Snake River in Idaho and the Columbia River in Washington and Oregon, where they have been measured to be over 1 mi (2 km) in thickness. Calderas are a common feature on shield volcanoes. They are formed and reformed over the volcano's lifespan. Long eruptive periods form cinder cones, which then collapse over time to form calderas. The calderas are often filled up by future eruptions, or formed elsewhere, and this cycle of collapse and regeneration takes place throughout the volcano's lifespan. Interactions between water and lava at shield volcanoes can cause some eruptions to become hydrovolcanic. These explosive eruptions are drastically different from the usual shield volcanic activity, and are especially prevalent at the waterbound volcanoes of the Hawaiian Isles. ʻAʻa advances over solidified pāhoehoe on Kīlauea, Hawaiʻi. A pāhoehoe lava fountain on Kīlauea erupts. Pāhoehoe flows enter the Pacific Ocean on Hawaiʻi island. Puʻu ʻŌʻō, a parasitic cinder cone on Kīlauea, lava fountaining at dusk in June 1983, near the start of its current eruptive cycle. Shield volcanoes are found worldwide. They can form over hotspots (points where magma from below the surface wells up), such as the Hawaiian–Emperor seamount chain and the Galápagos Islands, or over more conventional rift zones, such as the Icelandic shields and the shield volcanoes of East Africa. Many shield volcanoes are found in ocean basins, such as Tamu Massif, the world's largest, although they can be found inland as well—East Africa being one example of this. The largest and most prominent shield volcano chain in the world is the Hawaiian Islands, a chain of hotspot volcanoes in the Pacific Ocean. The Hawaiian volcanoes are characterized by frequent rift eruptions, their large size (thousands of km3 in volume), and their rough, decentralized shape. Rift zones are a prominent feature on these volcanoes, and account for their seemingly random volcanic structure. They are fueled by the movement of the Pacific Plate over the Hawaii hotspot, and form a long chain of volcanoes, atolls, and seamounts 2,600 km (1,616 mi) long with a total volume of over 750,000 km3 (179,935 cu mi). The chain contains at least 43 major volcanoes, and Meiji Seamount at its terminus near the Kuril–Kamchatka Trench is 85 million years old. The volcanoes follow a distinct evolutionary pattern of growth and death. The chain includes the second largest volcano on Earth, Mauna Loa, which stands 4,170 m (13,680 ft) above sea level and reaches a further 13 km (8 mi) below the waterline and into the crust, approximately 80,000 km3 (19,000 cu mi) of rock. Kīlauea, meanwhile, is one of the most active volcanoes on Earth, with the current ongoing eruption having begun in January 1983. The Galápagos Islands are an isolated set of volcanoes, consisting of shield volcanoes and lava plateaus, located 1,200 km (746 mi) west of Ecuador. They are driven by the Galápagos hotspot, and are between approximately 4.2 million and 700,000 years of age. The largest island, Isabela Island, consists of six coalesced shield volcanoes, each delineated by a large summit caldera. Española, the oldest island, and Fernandina, the youngest, are also shield volcanoes, as are most of the other islands in the chain. The Galápagos Islands are perched on a large lava plateau known as the Galápagos Platform. This platform creates a shallow water depth of 360 to 900 m (1,181 to 2,953 ft) at the base of the islands, which stretch over a 174 mi (280 km)-long diameter. Since Charles Darwin's visit to the islands in 1835 during the Second voyage of HMS Beagle, there have been over 60 recorded eruptions in the islands, from six different shield volcanoes. Of the 21 emergent volcanoes, 13 are considered active. Blue Hill is a shield volcano on the south western part of Isabela Island in the Galápagos Islands and is one of the most active in the Galapagos, with the last eruption between May and June 2008. The Geophysics Institute at the National Polytechnic School in Quito houses an international team of seismologists and volcanologists whose responsibility is to monitor Ecuadors numerous active volcanoes in the Andean Volcanic Belt and the Galapagos Islands. La Cumbre is an active shield volcano on Fernandina Island in the Galapagos that has been erupting since April 11, 2009. The Galápagos islands are geologically young for such a big chain, and the pattern of their rift zones follows one of two trends, one north-northwest, and one east–west. The composition of the lavas of the Galápagos shields are strikingly similar to those of the Hawaiian volcanoes. Curiously, they do not form the same volcanic "line" associated with most hotspots. They are not alone in this regard; the Cobb–Eickelberg Seamount chain in the North Pacific is another example of such a delineated chain. In addition, there is no clear pattern of age between the volcanoes, suggesting a complicated, irregular pattern of creation. How exactly the islands were formed remains a geological mystery, although several theories have been fronted. Another major center of shield volcanic activity is Iceland. Located over the Mid-Atlantic Ridge, a divergent tectonic plate in the middle of the Atlantic Ocean, Iceland is the site of about 130 volcanoes of various types. Icelandic shield volcanoes are generally of Holocene age, between 5,000 and 10,000 years old, except for the island of Surtsey, a Surtseyan shield. The volcanoes are also very narrow in distribution, occurring in two bands in the West and North Volcanic Zones. Like Hawaiian volcanoes, their formation initially begins with several eruptive centers before centralizing and concentrating at a single point. The main shield then forms, burying the smaller ones formed by the early eruptions with its lava. Icelandic shields are mostly small (~15 km3 (4 cu mi)), symmetrical (although this can affected by surface topography), and characterized by eruptions from summit calderas. They are composed of either tholeiitic olivine or picritic basalt. The tholeiitic shields tend to be wider and shallower than the picritic shields. They do not follow the pattern of caldera growth and destruction that other shield volcanoes do; caldera may form, but they generally do not disappear. East Africa is the site of volcanic activity generated by the development of the East African Rift, a developing plate boundary in Africa, and from nearby hotspots. Some volcanoes interact with both. Shield volcanoes are found near the rift and off the coast of Africa, although stratovolcanoes are more common. Although sparsely studied, the fact that all of its volcanoes are of Holocene age reflects how young the volcanic center is. One interesting characteristic of East African volcanism is a penchant for the formation of lava lakes; these semi-permanent lava bodies, extremely rare elsewhere, form in about nine percent of African eruptions. The most active shield volcano in Africa is Nyamuragira. Eruptions at the shield volcano are generally centered within the large summit caldera or on the numerous fissures and cinder cones on the volcano's flanks. Lava flows from the most recent century extend down the flanks more than 30 km (19 mi) from the summit, reaching as far as Lake Kivu. Erta Ale in Ethiopia is another active shield volcano, and one of the few places in the world with a permanent lava lake, which has been active since at least 1967, and possibly since 1906. Other volcanic centers include Menengai, a massive shield caldera, and Mount Marsabit, near the town of Marsabit. Volcanoes are not limited to Earth; they can exist on any rocky planet or moon large or active enough to have a molten core, and since probes were first launched in the 1960s, volcanoes have been found across the solar system. Shield volcanoes and volcanic vents have been found on Mars, Venus, and Io; cryovolcanoes on Triton; and subsurface hotspots on Europa. The volcanoes of Mars are very similar to the shield volcanoes on Earth. Both have gently sloping flanks, collapse craters along their central structure, and are built of highly fluid lavas. Volcanic features on Mars were observed long before they were first studied in detail during the 1976–1979 Viking mission. The principal difference between the volcanoes of Mars and those on Earth is in terms of size; Martian volcanoes range in size up to 14 mi (23 km) high and 370 mi (595 km) in diameter, far larger than the 6 mi (10 km) high, 74 mi (119 km) wide Hawaiian shields. The highest of these, Olympus Mons, is the tallest known mountain on any planet in the solar system. Venus also has over 150 shield volcanoes which are much flatter, with a larger surface area than those found on Earth, some having a diameter of more than 700 km (430 mi). Although the majority of these are long extinct it has been suggested, from observations by the Venus Express spacecraft, that many may still be active. ^ a b c d e f g Topinka, Lyn (28 December 2005). "Description: Shield Volcano". USGS. Retrieved 21 August 2010. ^ Douglas Harper (2010). "Shield". Online Etymology Dictionary. Douglas Harper. Retrieved February 13, 2011. ^ a b c John Watson (1 March 2011). "Principal Types of Volcanoes". United States Geological Survey. Retrieved 30 December 2013. ^ a b c d e f g h "How Volcanoes Work: Shield Volcanoes". San Diego State University. Retrieved 30 December 2013. ^ "Purico Complex". Global Volcanism Program. Smithsonian Institution. Retrieved 30 December 2013. ^ "Billy Mitchell". Global Volcanism Program. Smithsonian Institution. Retrieved 30 December 2013. ^ Bruce Perry. "Igneous Rocks Tour: Volcanoes and Lava Flows". California State University, Long Beach. Archived from the original on 18 April 2014. Retrieved 30 December 2013. ^ a b c d "Shield Volcanoes". University of North Dakota. Archived from the original on 8 August 2007. Retrieved 22 August 2010. ^ J.G. Moore (1987). "Subsidence of the Hawaiian Ridge". Volcanism in Hawaii: Geological Survey Professional Paper, Volume 1350, Issue 1. ^ Brian Clark Howard (5 September 2013). "New Giant Volcano Below Sea Is Largest in the World". National Geographic. Retrieved 31 December 2013. ^ Hasenaka, T. (October 1994). "Size, distribution, and magma output rate for shield volcanoes of the Michoacán-Guanajuato volcanic field, Central Mexico". Journal of Volcanology and Geothermal Research. 1. Elsevier. 63 (2): 13–31. Bibcode:1994JVGR...63...13H. doi:10.1016/0377-0273(94)90016-7. ^ a b c d e "How Volcanoes Work: Hawaiian Eruptions". San Diego State University. Retrieved 27 July 2014. ^ a b c World Book: U · V · 20. Chicago: Scott Fetzer. 2009. pp. 438–443. ISBN 978-0-7166-0109-8. Retrieved 22 August 2010. ^ Marco Bagnardia; Falk Amelunga; Michael P. Poland (September 2013). "A new model for the growth of basaltic shields based on deformation of Fernandina volcano, Galápagos Islands". Earth and Planetary Science Letters. Elsevier. 377–378: 358–366. Bibcode:2013E&PSL.377..358B. doi:10.1016/j.epsl.2013.07.016. ^ Regelous, M.; Hofmann, A. W.; Abouchami, W.; Galer, S. J. G. (2003). "Geochemistry of Lavas from the Emperor Seamounts, and the Geochemical Evolution of Hawaiian Magmatism from 85 to 42 Ma". Journal of Petrology. Oxford University Press. 44 (1): 113–140. Bibcode:2003JPet...44..113R. doi:10.1093/petrology/44.1.113. ^ Gerardo Carrasco-Núñeza; et al. (30 November 2010). "Evolution and hazards of a long-quiescent compound shield-like volcano: Cofre de Perote, Eastern Trans-Mexican Volcanic Belt". Journal of Volcanology and Geothermal Research. 1. Elsevier. 197 (4): 209–224. Bibcode:2010JVGR..197..209C. doi:10.1016/j.jvolgeores.2009.08.010. ^ "Summary of the Pu'u 'Ō 'ō-Kupaianaha Eruption, 1983-present". United States Geological Survey - Hawaii Volcano Observatory. 4 October 2008. Retrieved 5 February 2011. ^ a b c Bill White & Bree Burdick. "Volcanic Galapagos: Formation of an Oceanic Archipelago". University of Oregon. Retrieved 23 February 2011. ^ a b c "VHP Photo Glossary: Shield volcano". USGS. 17 July 2009. Retrieved 23 August 2010. ^ Topinka, Lyn (18 April 2002). "Description: Lava Tubes and Lava Tube Caves". USGS. Retrieved 23 August 2010. ^ James S. Monroe; Reed Wicander (2006). The changing Earth : exploring geology and evolution (5th ed.). Belmont, CA: Brooks/Cole. p. 115. ISBN 978-0-495-55480-6. Retrieved February 22, 2011. ^ Watson, Jim (5 May 1999). "The long trail of the Hawaiian hotspot". United States Geological Survey. Retrieved 13 February 2011. ^ Regelous, M.; Hofmann, A.W. ; Abouchami, W.; Galer, S.J.G. (2003). "Geochemistry of Lavas from the Emperor Seamounts, and the Geochemical Evolution of Hawaiian Magmatism from 85 to 42 Ma" (PDF). Journal of Petrology. Oxford University Press. 44 (1): 113–140. Bibcode:2003JPet...44..113R. doi:10.1093/petrology/44.1.113. Archived from the original (PDF) on 19 July 2011. Retrieved 13 February 2011. ^ "Evolution of Hawaiian Volcanoes". Hawaiian Volcano Observatory - United States Geological Survey. 8 September 1995. Retrieved 28 February 2011. ^ a b "How Volcanoes Work: Galapagos Shield Volcanoes". San Diego State University. Retrieved 22 February 2011. ^ "Volcanoes". Galapagos Online Tours and Cruises. Archived from the original on 23 July 2001. Retrieved 22 February 2011. ^ a b "Volcanoes of South America: Galápagos Islands". Global Volcanism Program. Smithsonian National Museum of Natural History. Retrieved 22 February 2011. ^ a b c d Ruth Andrews & Agust Gudmundsson (2006). "Holocene shield volcanoes in Iceland" (PDF). University of Göttingen. Archived from the original (PDF) on 11 June 2007. Retrieved 21 February 2011. ^ "Galapagos volcano erupts, could threaten wildlife". October 22, 2015. Archived from the original on 2009-04-15. ^ Bailey, K. (30 April 1976). "Potassium-Argon Ages from the Galapagos Islands". Science. American Association for the Advancement of Science. 192 (4238): 465–467. Bibcode:1976Sci...192..465B. doi:10.1126/science.192.4238.465. PMID 17731085. Retrieved 25 February 2011. ^ Rossi, M. J. (1996). "Morphology and mechanism of eruption of postglacial shield volcanoes in Iceland". Bulletin of Volcanology. Springer. 57 (7): 530–540. Bibcode:1996BVol...57..530R. doi:10.1007/BF00304437. Retrieved 24 February 2011. ^ a b Lyn Topinka (2 October 2003). "Africa Volcanoes and Volcanics". United States Geological Survey. Retrieved 28 February 2011. ^ "Menengai". Global Volcanism Program. Smithsonian National Museum of Natural History. Retrieved 28 February 2011. ^ Heather Couper & Nigel Henbest (1999). Space Encyclopedia. Dorling Kindersley. ISBN 978-0-7894-4708-1. ^ Watson, John (February 5, 1997). "Extraterrestrial Volcanism". United States Geological Survey. Retrieved February 13, 2011. ^ Masursky, H.; Masursky, Harold; Saunders, R. S. (1973). "An Overview of Geological Results from Mariner 9". Journal of Geophysical Research. 78 (20): 4009–4030. Bibcode:1973JGR....78.4031C. doi:10.1029/JB078i020p04031. ^ Carr, M.H., 2006, The Surface of Mars, Cambridge, 307 p.
^ "Large Shield Volcanoes". Oregon State University. Retrieved April 14, 2011. ^ Nancy Atkinson (8 April 2010). "Volcanoes on Venus May Still Be Active". Universe Today. Retrieved April 14, 2011.